Contemporary Waterfront Dream Home! No detail overlooked in this complete remodel. Rebuilt from top to bottom in 2014, everything is luxuriously high end. Resort style outdoor living w/ pergola. Chef's kitchen with island & imported granite. Integrated surround audio system carries into outdoor living areas. System & TV's all convey. Must see to appreciate the quality & upgrades. NEW Roof. NEW Electrical & Plumbing. NEW Doors & Windows. NEW Seawall, Dock & Boat House. NEW Salt System Heated Pool. Boat house with lift & remote operated shades. All lighting is LED w/ dimmers. Landscape lighting. 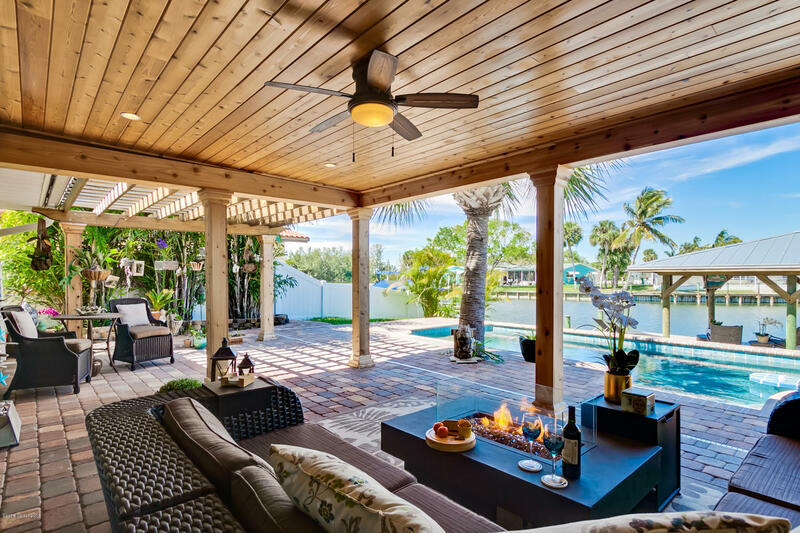 This safe harbor home is situated near the mouth of the canal, providing easy access to the Banana River & the Thousand Islands. Desirable Cocoa Beach community with the Beach just down the street.